One of the first posts I ever wrote was about the Pi Day Pie I promised #3 I would make for her seventh-grade math class, and then forgot about. 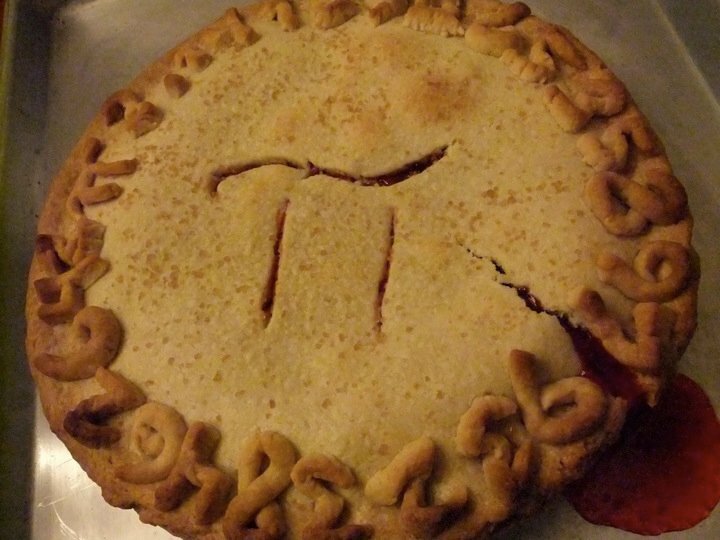 It continues to be one of my more popular posts, particularly around this time of year when geeks like me are looking for badass pictures of Pi Day Pies. Now, Pi Day is not to be confused with Pie Day. Pie Day is January 23 and is best handled by real pie makers like Beth Howard of The World Needs More Pie fame. I’m bleeding significant digits here, people. And I think you guys can make even more badass pies! This year I am opening the challenge to all y’all. It’s simple: make a Pi Day Pie, send me a picture and tell me about it. This is purely a presentational contest. That’s the best part: YOU GET TO EAT YOUR OWN PIE! by 11:59pm on March 13, 2013. I will announce the winner on Pi Day, March 14. You get points for creativity- whether it’s in ingredients, presentation, or the story you tell about it. Posted on March 1, 2013 March 2, 2013 by JM RandolphPosted in YumTagged baking, giveaway, JM Randolph, math, photo challenge, pi day, pie, Pie Day Pie, Poopourri. This is a tough one, because my crust is the key, and it lacks that certain visual aesthetic… I’ll find a way, though. I’ll find a way. I’m anticipating a full on Byronic/Jules pie rumble. Also can I just commend your long-term memory (re: left-handedness), Peggles? I think you should be considered an honorary entrant just for that. I have been so inspired by Beth Howard. Pie is actually really simple. And it does make people happy! You should give it a shot. Or eat someone else’s pie 🙂 Poopourri is the shizz. including a giant chocolate chip cookie pie and an ice cream pie. Each year would bring a new surprise, so go for it Julie. Our only condition was that it had to be homemade! That. Is. HOT. I’m palpitating. I thought of your pie the other day when a coworker was saying he hoped his daughter’s boyfriend proposed to her on pi day (since she loves math so much). I cannot make pie to save my life. But I really want to win this. Can I win if I volunteer to EAT everyone else’s pie? Do you need an unbiased, really motivated judge? Hmmm? Sadly, nobody is sending me pie. They’re only sending pictures. However, do not be afraid to doctor a store-bought pie. I will totally accept that as an entry. Hmmmmmm,,,never heard of “pi day” in Canada when growing up,,,but since I loovvee pie,,,I may just partake in making and eating pie! Oh, I hope you do! We need some Canadian pie. wasnt able to make pie,,,,I was too busy doing canadian things,,aka,,,drinking beer!